Jumping into compute, we should see a mix of results here, with some tests favoring the GK110 based GTX 780’s more compute capable design, while other tests will punish it for not being a fast FP64 card like GTX Titan. 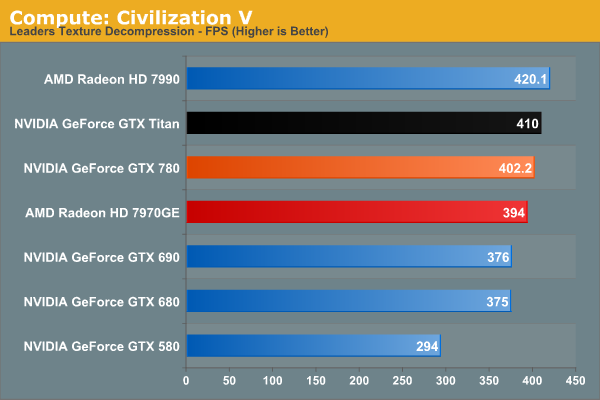 Civilization V’s DirectCompute performance is looking increasingly maxed out at the high end. 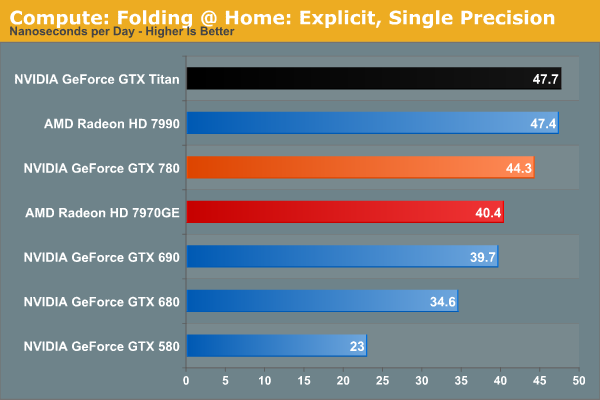 At 402fps the GTX 780 may as well be tied with GTX Titan. On the other hand it’s a reminder that while we don’t always see NVIDIA do well in our more pure compute tests, it can deliver where it matters for games with DirectCompute. 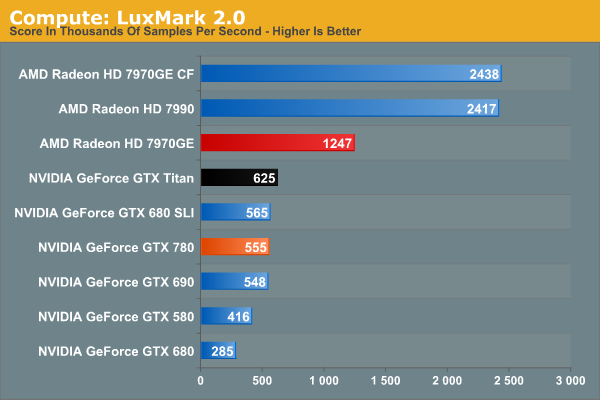 NVIDIA has never done well at LuxMark, and GTX 780 won’t change that. It’s greatly faster than GTX 680 and that’s about it. Kepler parts, including GK110, continue to have trouble with our OpenCL benchmarks, as evidenced by the fact that GTX 780 doesn’t beat GTX 580 by nearly as much as the generational improvements should lead to. GK110 is a strong compute GPU, but not in ways that LuxMark is going to benefit. GTX 780 still struggles some at compute with CLBenchmark, but less so than with LuxMark. 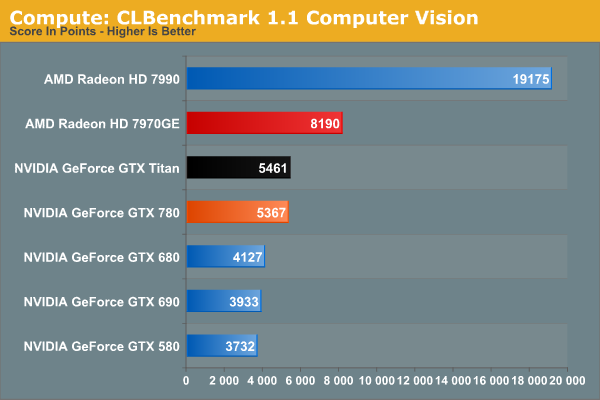 7970GE is the clear winner here in both tests, while GTX 780 stays remarkably close to GTX Titan in performance. The fluid simulation in particular makes GTX 780 look good on a generational basis, more than doubling GTX 580’s performance. Moving on, our 4th compute benchmark is FAHBench, the official Folding @ Home benchmark. Folding @ Home is the popular Stanford-backed research and distributed computing initiative that has work distributed to millions of volunteer computers over the internet, each of which is responsible for a tiny slice of a protein folding simulation. FAHBench can test both single precision and double precision floating point performance, with single precision being the most useful metric for most consumer cards due to their low double precision performance. Each precision has two modes, explicit and implicit, the difference being whether water atoms are included in the simulation, which adds quite a bit of work and overhead. This is another OpenCL test, as Folding @ Home has moved exclusively to OpenCL this year with FAHCore 17. The Folding@Home group recently pushed out a major core update(FAHBench 1.2.0), which we’ve rerun on a number of cards and is reflected in our results. Unfortunately this version also broke single precision implicit on AMD GPUs and AMD’s latest drivers, so we only have NVIDIA GPUs for that section. 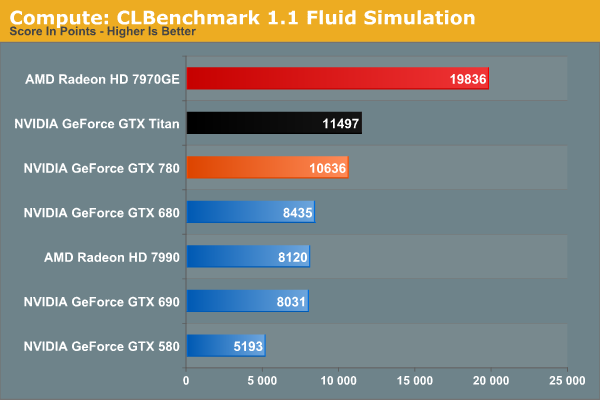 In any case, despite the fact that this is an OpenCL benchmark this is one of the cases where NVIDIA GPUs do well enough for themselves in single precision mode, with GTX 780 surpassing 7970GE, and falling behind only GTX Titan and the 7990. GTX 780 doesn’t necessarily benefit from GK110’s extra compute functionality, but it does see a performance improvement over GTX 680 that’s close to the theoretical difference in shader performance. 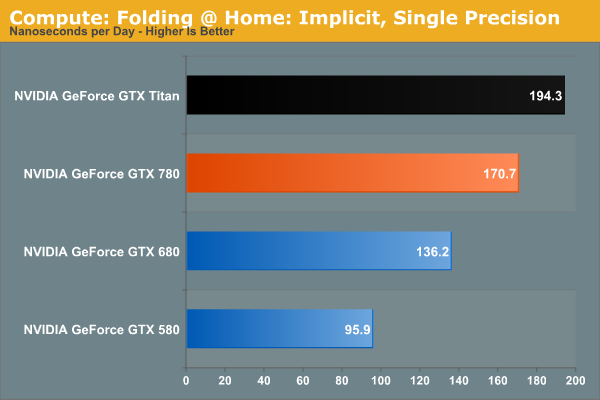 Meanwhile in double precision mode, the lack of an uncapped double precision mode for GTX 780 means that it brings up the bottom of the charts compared to Titan and its 1/3 FP64 rate. Compute customers looking for a bargain NVIDIA card (relatively speaking) will need to stick with Titan. 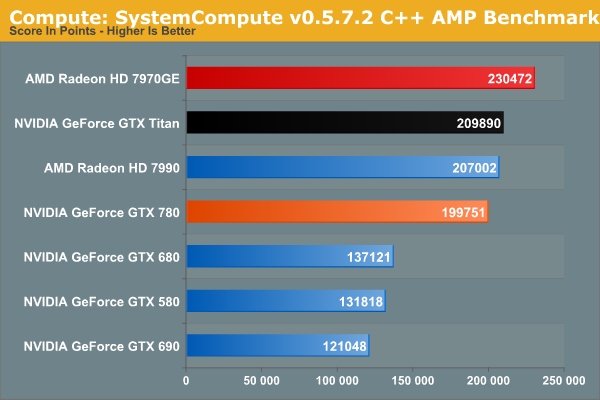 SystemCompute shows very clear gains over both the GTX 680 and GTX 580, while trailing the GTX Titan as expected. 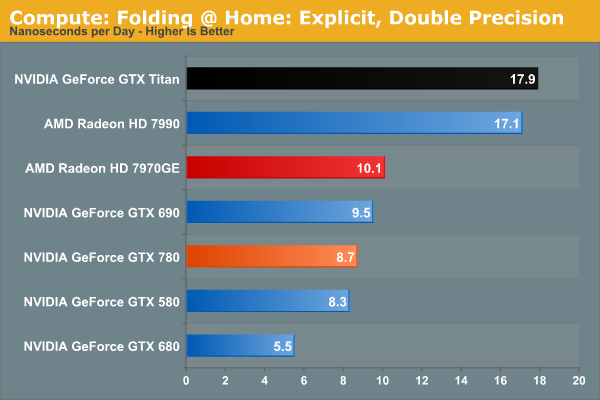 However like Titan, both trail the 7970GE. "NVIDIA will be pricing the GTX 680 at $650, $350 below the GTX Titan and GTX 690, and around $200-$250 more than the GTX 680." Yeah, 'cause AMD's more bang-for-the-buck. Basically, NVidia's 'he' 'cause it's always the most powerful, but also costs the most. AMD's 'she' 'cause it's always more efficient and reasonable. I'm a guy, and guys are usually more about power and girls are more about the overall package.